The geese are flying, gathering for their trip south. Once they take off for good, the Canada Goose is known to fly in a “v” shape, with one taking turns leading the pack. They fall to the back when they tire and another bird takes over. 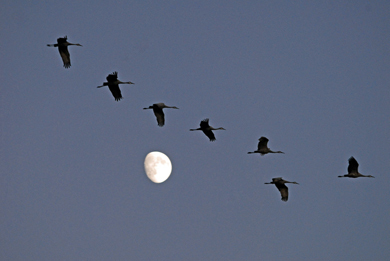 As they fly, which is day or night, they honk along the way. This is said to be part of giving support to each other as they fly. Besides the migratory Canada Goose, there are many resident geese that stay over the winter, near water sources, etc., and look much like the migratory ones. This harbinger of autumn and winter has become a common sight in the Midwest at this time of year, and now Canada geese are known to fly as far south as the Falkland Islands. Whether they are a welcome sight for you or not, there was a time they were on the endangered list. They are a source of food for many persons and animals.